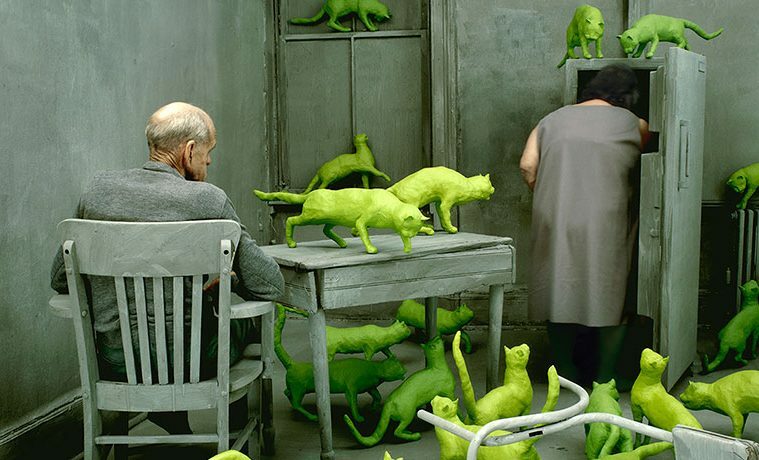 IMAGE ABOVE: Sandy Skoglund, Radioactive Cats, 1980. Cibachrome print, 29 11/16 x 37 3/16 in. Radioactive Cats © 1980 Sandy Skoglund. 7/16 in. x 25 in. 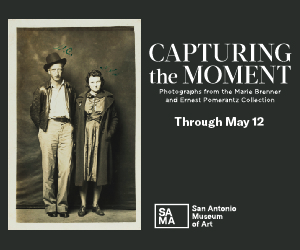 In the Company of Cats and Dogs is an ambitious multimedia exhibition at the University of Texas. 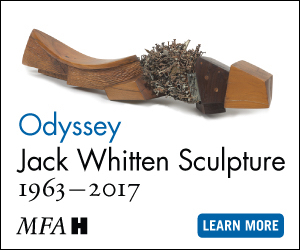 Spanning an impressive 33 centuries, it features 150 works from ancient Egypt, Greece, China and pre-Columbian America as well as post-15th century works from Europe, the United States, and Japan. All find common ground in how they explore the changing relationships between humans and our two most beloved companion animals. The presentation includes paintings, photographs, drawings, engravings, etchings sculptures and manuscript illustrations. Nine basic themes—religion, mythology, hunting, herding, literature, morality, abandonment, aggression and domesticity—serve to organize the artwork and suggest how human attitudes toward cats and dogs have evolved over time. A sinuously eloquent Late Period Egyptian sculpture called Seated Cat reveals a deep reverence for felines. Stunning ceramic cups, bowls and pots from ancient Greece and from the Han and Jin dynasties in China suggest affection and respect for canines. The rise of Christianity in the West brought with it suspicions toward both animals. Cats would remain largely absent from western art until the 18th century. But works like Battista Franco’s Venus and Adonis (1554) and Albrecht Dürer’s St. Eustace (1501) suggest that by the early Renaissance, dogs had come to represent positive traits like loyalty and innocence. Dürer’s work also reveals how hunting was the sport of European nobles, who actively bred canines to assist in capturing quarry. Hunting dogs became so valued that posing with them elevated the status of wealthy, non-noble sitters like the banker in Jean-Marc Nattier’s Portrait of a Gentleman as Hunter (1727). Americans popularized hunting and breeding. John Martin Tracy’s late 19th century painting, Woodcock shooting in a wood (n.d.) shows how artists portrayed ordinary men and their hunting dogs as equal partners in the pursuit of game. Canines—which had found individual identities in dog clubs and shows—became popular subjects for portraits, as in Percival L. Rosseau’s Pointer in a Landscape (1909). Felines began to receive more favorable treatment in European art by the 18th century. No longer were they the maligned familiars of witches. Gusatve Doré’s Puss in Boots—an illustration that appears in the fairy tale collection, Les Contes de Charles Perrault (1864)—helped his owner win the heart of a princess, while the cat in Thomas Sully’s Cinderella at the Kitchen Fire (1843) brought comfort to the lonely. Many artists in the exhibition examine the ways cats and dogs also speak for humans and say more about us—and our values and desires—than we realize. In James Gillray’s The Injured Count, S—(1786), two cats suckling the bare breasts of a woman not only represent her supposed “unnaturalness” as a woman who favored pets over her own family but also her vice-ridden lifestyle. 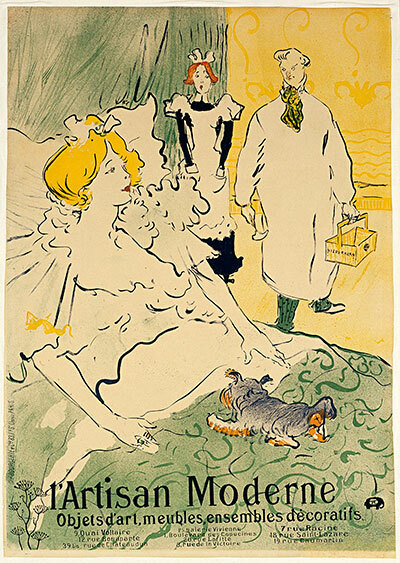 Meanwhile, Henri de Toulouse-Lautrec uses a small lap dog in his poster for L’Artisan Moderne (1896) as a playful reference to an affair between the dog’s female owner and a gentleman caller. The largest exhibition section is one that probes the domestic lives of people and their companion animals. Some works, like John Burton’s Victorian-era photo, Unidentified female with dog (n.d.) show how humans seem to unconsciously choose pets that not only complement their lifestyles, but even look like them. Others, like Henri Cartier-Bresson’s Igor Stravinsky, California (with cat) (1946), reveal the profoundly emotional nature of the human-animal connection. Often affectionate, at times antagonistic but undeniably symbiotic to the core, the human-companion animal relationship is as deep and old as it is complex. In the Company of Cats and Dogs offers compelling insight into how we see and understand our pets—and the ways they help us see and understand ourselves. M. M. Adjarian is an Austin-based freelance writer.